Tastes more like a bean than a pea and is in fact a member of the bean family and not a pea. 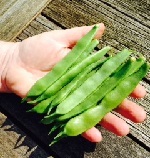 Short 'pea beans' are best eaten when around 3" (7.5cm). Very prolific so needs constant picking. Sow indoors at the end of April to transplant once danger of frosts is over or sow directly outdoors in May.